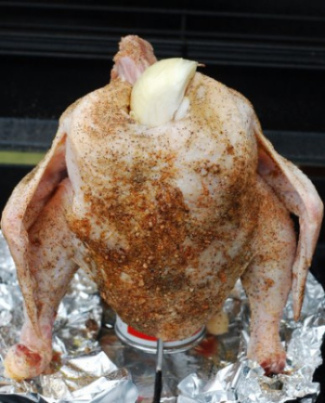 Ahh Beer Can Chicken, a staple food growing up and always a go-to grill option for my father. The logic is sound, prop up the bird so that the breast meat is not scorched by the direct heat of the grill and thus dried out. The beer gently steams the cavity adding a subtle nuance of malted barley and hops; the liquid also adding to the moisture of the meat. Brilliant. But wait. Is there a plastic liner in my beer can? What's this about Bisphenol-A (BPA)? Is BPA going to kill me? What about the paint on the outside? Is it true that Aluminum is linked to Alzheimer's Disease? Oh my gosh, is my Beer Can Chicken going to kill me? Is there a plastic liner in my beer can? - Most likely. Beer and soda are reactive to metals and would taste horrible out of a can without a liner of sorts. There is a wonderful article on the History of the Beverage Can by the Museum of Beverage Containers and Advertising that states that lined cans hit the market in 1935 - and the industry, basically, never looked back. What is all this news about BPA? - BPA is a building block of many everyday plastics. Researchers have correlated exposure to BPA to heart disease, diabetes and possibly cancer. Consumer awareness about BPA hit an all time high last April when news detailed baby bottles that contain BPA and Nalgene quickly removed its water bottles from shelves. Is BPA going to kill me? - Maybe. Not from drinking beer it appears [thank god] but a recent study by the Center for Disease Control fount BPA to be present in 93% of the population in the U.S. That's how everyday this stuff is. In 1995, the Society of the Plastics Industry, ran a study to quantify the migration of BPA from can coatings. They determined that an average adult consumer would have to consume "about 500 pounds of canned food and beverages every day for an entire lifetime to exceed the safe level of BPA set by the U.S. Environmental Protection Agency (EPA)." Before you sigh a breath of relief, there are some mitigating factors here... Do you trust that the EPA has correctly determined what safe exposures to BPA are? Do you trust the results of a BPA study conducted by the Society of the Plastic Industry? 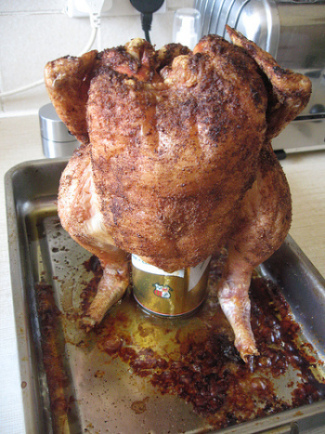 Why hasn't anyone studied the exposure generated by grilling a can of beer that's been stuffed in a chicken's rear end? What about the paint on the outside? Is it true that Aluminum is linked to Alzheimer's Disease? - "They" don't think so. The link between Aluminum and Alzheimer's was first put forward in 1965 and aluminum has been shown to be present in both plaques and tangles in the brains of people with Alzheimer's disease. I know people who avoid antiperspirant because they contain aluminum-based compounds. According to the Alzheimer's Society; however, "The overwhelming medical and scientific opinion is that the findings outlined above do not convincingly demonstrate a causal relationship between aluminum and Alzheimer's disease, and that no useful medical or public health recommendations can be made− at least at present (Massey and Taylor 1989)." Oh my gosh, is my Beer Can Chicken going to kill me? - I am completely unqualified to answer this, but... I don't think so. For what it's worth, this is my logic: As long as beer is still inside the can, the temperature won't reach much more than 212 degrees F, the boiling point of water. The boiling point of BPA is about 428 degrees F, so whatever BPA there might be inside the can liner, likely won't cook into the food. If it does, it will stay mostly inside the cavity of the bird and considering how unappetising chicken ribs are, no one is likely going to be eating them. The paint on the outside follows the same rules as far as I'm concerned. Ensure there is enough liquid in the can and the paint probably won't bake off either. Lastly, if you want to see how beverage cans are manufactured, thank How it's Made by the Discovery Channel for making this video.